Description: Ex-CR 8413 trails west. Description: NS 25G E.B. NS 21A W.B. 9:31 a.m. 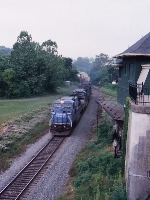 Description: An ex-Conrail 8-40CW and a NS D9-40C provide power for a westbound stack train crossing Rockville Bridge on a hot, hazy & humid morning. Description: NS 143 is southbound and is going through a 10mph slow order over the river just behind the end of the train. Description: NS 143 begins to throttle up after going through a slow order at CP-78 and the River. Description: NS 44V westbound at MP 57 on the NS Lurgan Branch in the late evening. Description: NS 8413 (ex-CR) waits for an eastbound NS train. Description: This unit caught my eye as we came up on it. This was a neat catch, an ex-TFM Unit! The logos were painted out and FURX Letting applied on the KCS-Like paint. Description: Eastbound NS intermodal waits for the arrival of a westbound before leaving the yard. Description: A hump set consisting of a 8-40CW still in its Conrail Quality paint and a high hood NS GP38-2 work to break down a train.